Ever since she learned the startling and dreadful truth about her abilities to visit other people's dreams, Janie has been horribly conflicted. She's torn between her love for Cabel and the want for companionship and her guilt at being such a hardship for those around her. The way Janie sees it, she has two choices, none of them good, but maybe one will give her some peace. But just when she thinks she's chosen her path, an unexpected person shows up...causing her to rethink everything. The third and final book in Lisa McMann's Wake trilogy is a quick, engrossing read. Though it lacks the pulse-pounding action of Fade, Gone never lacks for excitement as secrets from the past are unveiled and Janie is forced to confront issues she'd rather bury. Written in third person present tense, Gone has a very realistic air that makes it very easy to become immersed into, even as most of the drama unravels in Janie's own head as she pieces together bits of her past in order to decide what she must do about her future. Some of the scenes that might have been more emotionally intense, like when Janie and Cabel finally talk through their relationship issues, are glossed over, and the ending may seem a bit anticlimactic coming right after the intensity of Fade, but the denouement wraps up nicely, leaving readers satisfied. 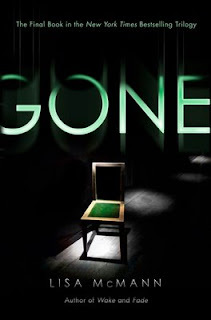 Gone is a thoughtful, absorbing conclusion to a wonderful trilogy. Cover Comments: I do like the drama of all of the covers in this trilogy, and I especially like how the green is used in Gone. The single chair is a very neat, almost chilling look, and it ties in with the story nicely. This cover is very modern and appealing, and I think it'll be popular for a long time. Gone will be available from Simon Pulse on February 9th, 2010! P.S You can only reread Wake and Fade so many times in anticipation for Gone...so check out Lisa McMann's website (lisamcmann.com) to read a short story in Cabel's point of view! It sounds fabulous. I want to read the three books in a row. Thanks for such a fair and even review. I can't wait to finish the trilogy! Great review! I can't wait for Gone to come out!! I read the first novel and really liked it, but I have not picked up the 2nd one. I just don't want to spend the money on it. Maybe I should since the third one is coming out soon. loving the fact that i just picked up both of the books over the wkend n started them yesterday. Couldn't put them down! Just finished the 2nd one n got online to check when the 3rd one would be released,... THRILLED that it is in just a few days!! Would've hated to wait months for the next one!! So looking forward to it!